Paint recommendation - weathered front steps. I was wondering if you could recommend the type of paint to use for this job; I am painting a set of front steps. What type of paint would you recommend, and what type of preparation should I do before beforehand? How much sanding would be required, what types of products could I use, etc. Thanks in advance for any advice you could give, I truly appreciate it. I think the ideal product for your situation is DeckOver by Behr. IT is an innovative new solid color coating that will bring your old, weathered wood or concrete back to life. DeckOver creates a durable coating on your tired wooden deck or steps. It will fill in cracks up to 1/4 inch wide and make your steps look like new. Be sure to follow the recommended steps for preparation of the wood surface. Thanks so much for the advice! It looks like a great product, but the reviews are a little bit middling; are there specific suggestions you could give that will help avoid the issues that some people have had in the past? Despite the protests of disappointed home owners, I am sure most did not follow the directions properly, and from some of the before and after pictures, their decks were in such bad shape they needed replacing. No paint is going to make a warn out deck like new again. None mentioned the fact that this product requires two coats. I wonder how many actually applied the second coat. Typically those who had a poor result for whatever reason, are the most vocal reviewers, the many hundreds of happy customers have gone on with their daily lives. I might suggest an alternative product, Rust-Oleum Restore Deck Coat 4x, it was one of the first deck refinishing products Home Depot offered and It has a very good track record. Check out the reviews on line. I am just finishing up a front porch refresh, I scraped and sanded old loose paint, I smoothed out , the best that I could, a flight of well used, worn out, front steps and porch floor surface. I have to say that your porch and stairs are in far better condition than my well season entryway. It looks to me like your steps and porch may be made of fir boards, my favorite, I grew up with a fir porch. 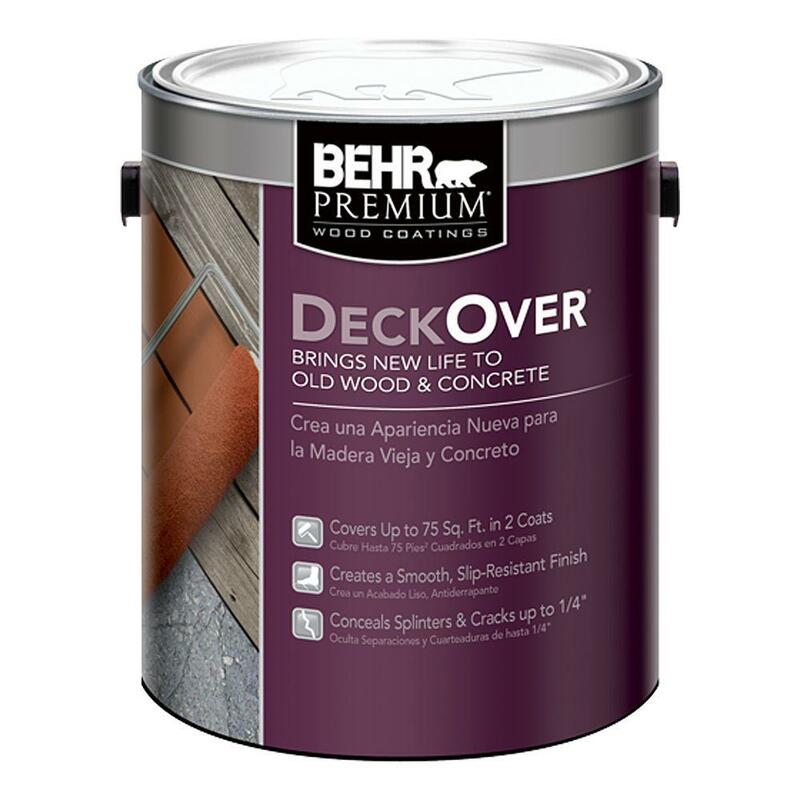 I read the great suggestions by Mike for the DeckOver process and the Behr Restore product too; I would like to make suggestion as well. Growing up in Boston, the spring brought many chores, and one of them was to paint the front porch floor. 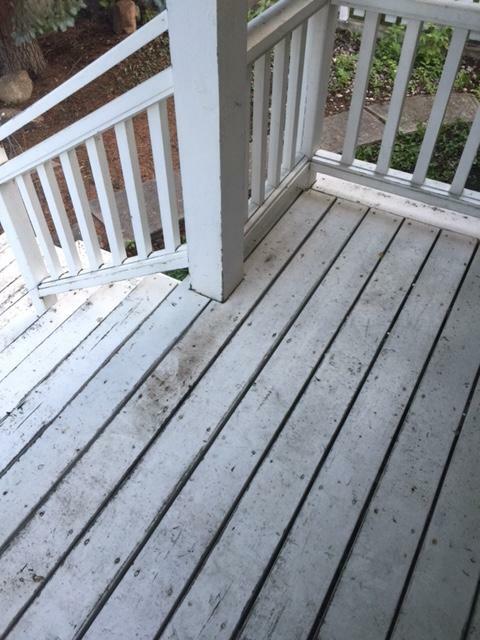 Every spring it was to be painted, if the porch floor didn’t get a fresh coat of paint at the beginning of the season, by the late summer early fall it was a mess, with chipping, and curling spots of peeling paint. So for that reason, one day in early spring the porch was swept down and washed, then the next day when it was clean and dry, the front entryway was closed off and the painting began. Every house on the block had the porch floor painted; “Battle Ship Grey” was the color of every porch floor in my neighborhood. It was an annual ritual, a good coat of paint does wonders; it keeps the place looking crisp and maintained. I was on porch floor duty many a year! I was a little late this year, I painted my porch in the summer, and it was hot! The spring and fall have better drying time with the cool, dry, days…..it is more conducive, during those cooler, drier seasons to accomplish outdoor chores. I want to recommend just painting your porch floor, Behr low luster Porch and Patio paint is an amazing product, it covers well, applies the perfect surface coating to a porch floor, comes in an array of colors or can the paint be custom mixed, it dries fast, and cleans up with soap and water! I love this paint! This suggestion is one that will have to be repeated, maybe not next season, but most likely within a few years. I, myself, do not mind knowing that it will have to be done again, home maintenance is and ongoing process, a giant circle….a refresh, a change of color, is so satisfying and rewarding. I chose, Putting Green, a grey-green color, I just love it! Dark colors hide blemishes well. 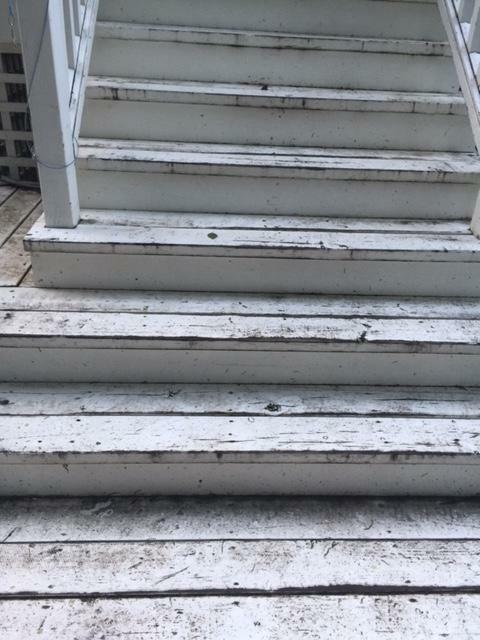 Thanks for the input on ClintonKirks steps and deck, first hand experience is invaluable in cases like this, where you can recommend a product you have actually used on your porch. 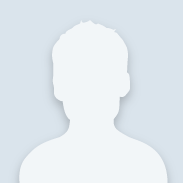 I hope ClintoinKirk can benefit from your experience. There is always a caveat when going over existing finishes: the adhesion of the top coat is only as good as the adhesion of the old finish being re-coated. If the old finish lets go, the new finish is coming up too! To this extent, it is imperative that the old finish be soundly bonded. If not, it should be totally removed, either through chemically stripping, or by sanding. My preference is the use of a belt sander loaded initially with 36 grit sanding belts, followed by smooth sanding with 100 grit paper. Behr solid hide stains or DeckOver are self priming. Two coats are needed for good performance over bare wood. These are water based acrylic products. Acrylics have the ability to "breathe", unlke oil products, allowing water vapor to pass on through the film without it peeling, provided a a good bond to the bare wood is had.